Bill Childress was born and raised in Tennessee. He grew up in La Follette, Tennessee, and attended the University of Tennessee at Knoxville. Upon completion of his undergraduate degree there, he went west to Memphis and received his DDS from University of Tennessee Health Science Center in 1989. Dr. Childress joined the United States Air Force and completed a General Practice Residency at Wright Patterson Air Force Base in Dayton, Ohio. Captain Childress served as a general dentist for four years at MacDill AFB, Tampa, Florida. He transferred to Lackland AFB, in San Antonio, Texas, and entered a six-year Oral & Maxillofacial Surgery Residency at the USAF’s Wilford Hall Medical Center. 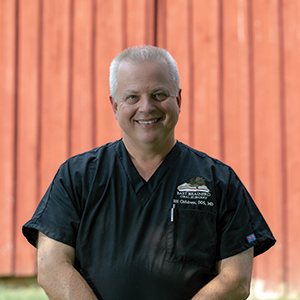 While in the OMS residency, Dr. Childress graduated from medical school at the University of Texas Health Science Center, San Antonio, and received a medical degree in 1998. He received certificates of completion for a General Surgery Internship in 1999, and the Oral Maxillofacial Surgery Residency in 2000. Major Childress moved to Eglin Air Force Base, Florida, and served as a staff Oral Surgeon at the Air Force hospital there. He was promoted to Lieutenant Colonel in 2001. In 2003, he moved back to San Antonio, Texas and Wilford Hall Medical Center, and served as a staff oral surgeon, Training Officer for the Oral & Maxillofacial Surgery Residency, was promoted to Colonel in 2008, and retired in 2010 as Program Director of the Air Force’s largest Oral & Maxillofacial Surgery residency. Dr. Childress has looked forward to coming home to Tennessee for 21 years, as he served his country in the Air Force. His wife, Betsy, grew up in Jefferson City, Tennessee, and graduated from Carson-Newman College. They have two children, Justin and Meredith.